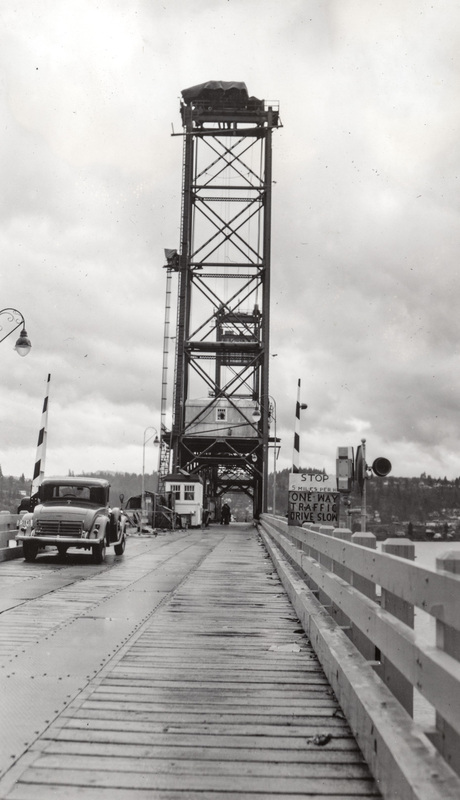 Since the lift span on the bridge has been in the news lately, I thought I'd post this view from March 1940 when it was being installed. We saw it in what was likely its first lift operation in this April 1940 image. Nice shot of the " Hood River White Salmon Bridge " ! What is with the metal strips running lengthwise over the planking? Was this for heavy construction equipment used in installing the lift span? If it was there for normal use would vehicles have travelled down the center of the bridge unless they met oncoming traffic? There were many one lane bridge in the mid Atlantic region when I was growing up that supported two way traffic sometimes at high speed. This high speed game of chicken scared the heck out of my dad. Most of these bridges were replaced by the mid seventies or had traffic lights added. There is an old wooden building, down on the waterfront on the right side. Any idea what that building is? I'm sure glad that isn't my job. If it was, the lift would never get installed. I don't like water and I don't like high places. I can't imagine working way up there over the water. Wonder how many different decks the Hood River-White Salmon bridge has had over the years? Anyone know the make and year of the car? Metal plates for the driving lane, on the rare occasion you meet another both moved right and shared the metal. We did the same on roads that had one concrete lane to share.